“Urban landscapes have always played an important part in my paintings. Birmingham is a city that has become very important to me and I wanted to capture some of the wonderful architecture and history that this city has to offer”. In the subject and atmospheric quality of these works, the influence of Reuben Colley is evident. In 2009 Garland, who admired Colley’s work, made contact with the Birmingham-based artist, who creates uncompromising oil paintings of his home-town, Birmingham. For Colley, “Painting…. should be a very natural process, without the restraints of gimmick and style, it is an infinite language of expression, only I find it much more comforting than using words”. This sentiment applies to Garland’s series. Like Colley, Garland avoids all gimmick; instead it is his exquisite rendering of light which invites the viewer into what would otherwise be cold, derelict and empty spaces. He asks us to see beauty in the peeling paint or puddles of water which he has truthfully included. “I love to paint light, and use layers of thin glazes to build up the luminosity in my paintings”. Garland’s paintings are also marked by their intriguing interplay of inside and outside space. He merges boundaries through windowless trams, open warehouses, and bridges that connect to abandoned buildings. In The Old Joint Stock Interior, the viewer’s eye is drawn upwards to domed, glass ceiling and sunlight which infiltrates the room. Particularly clever are the intricate reflections of outside light and geometric window panes within pools of water in Sunspots. In contrast to the sunlit spaces of many paintings, The Old Joint Stock Evening and Café Rouge are clearly set at dusk. Marked by fading sunlight, emotive lighting comes instead from neon signs and a warm glow emanating from the buildings’ windows. In The Corner of Kenmare there is a nostalgic quality to the ethereal lighting. 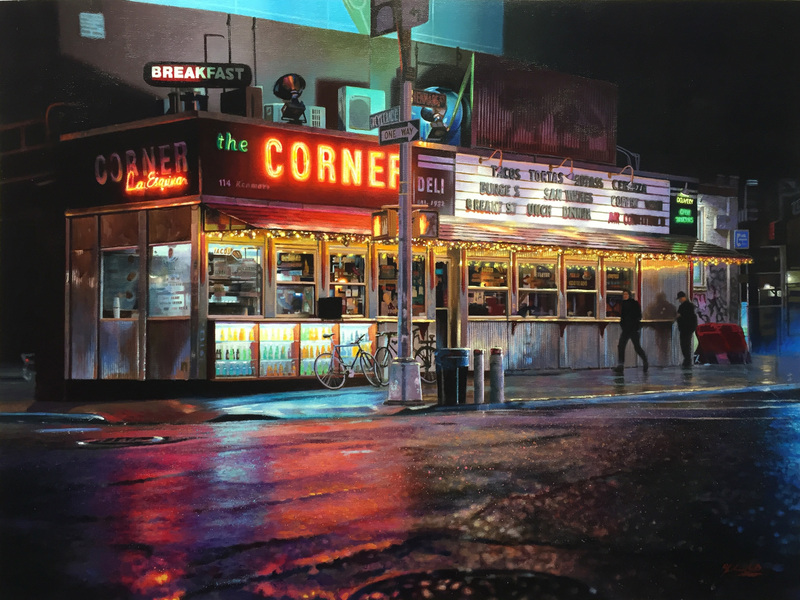 This use of light, as well strong diagonals within the composition, evokes Edward Hopper’s dynamic paintings, and in particular, his famous masterpiece Nighthawks (1942). Rick Garland began his career as an illustrator and it was only in 2009 that he launched his career as a Realist painter. His rigorous training, as well as his art historical study of the Pre-Raphaelites (whose work can be found in the Birmingham Museums), is evident in this series. His rich palette and meticulous attention to detail define works such as Tram Terminal II, as well as the remarkable, and largest painting of his career so far, Love’s End which hangs on the far wall. “What inspired me to start painting empty spaces was the fact that these once amazing old buildings have been left to fall into a state of disrepair and even though the floors are full of rubbish, the walls might have graffiti and peeling paint or there are puddles from the leaking roof they are still intrinsically beautiful”. Garland uses his skilled Realism to picture everyday life and the modern world (of Birmingham). He also uses it to focus in on the act of painting itself. He cleverly references the act of creating art, through striking inclusions of street art and graffiti on tall pillars and empty walls in The Writing’s on the Wall and Over and Over and Over. In this striking new series, Garland clearly shows that Realism is a contemporary art, and one which he has mastered. Rick Garland’s solo show at Reuben Colley Fine Arts will run until 3rd December, 2016. Further details about the exhibition and gallery, as well as an exhibition catalogue, can be found here.